This is a repeat from 2015, with a minor update. Cities are coming back across the US for many reasons. The unsafe, dirty urban core of legend is being replaced by funky, hip neighborhoods with character and charm. Life in the city can be good, now that the perma-haze of pollution has been tamed. Transit helps make life more relaxing and even cheaper. Young people in particular find revitalized cities to be affordable and great places to meet their mate and then raise kids. 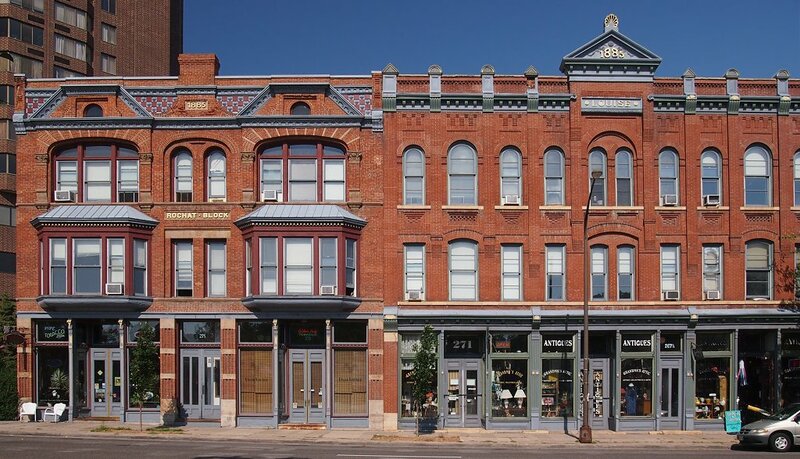 The movement owes a lot to New Urbanism, junking the old industrial model for cities as centers for jobs and emphasizing attractive, functional places to live. We’ve learned a lot. But if there is one flaw in this model it’s the constant emphasis on higher and higher density. There’s always a place for high density in the urban world, of course, but it doesn’t work everywhere. A better way to look at what makes cities great is a model based on the density gradient – a gradual increase towards the core that is economically and aesthetically sustainable. The bad old days. But we also still do this. 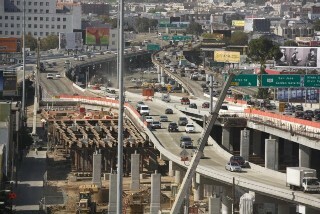 When highway construction was the rage at the end of the twentieth century many urban cores were ringed with freeways. Access to the jobs at the center would encourage growth, the theory went, and the houses in the way were only a nuisance. They were easily replaced with large towers that held the same number of people more “efficiently” – which is why so many public hi-rises line urban freeways to this day. There are many reasons why this massive destruction of the urban landscape didn’t work. One way of looking at their folly, however, is an understanding of the importance of a density gradient, which is to say a gradual increase in both aesthetic and population density as you approach the urban core. Why is this important? Humans like the feeling when things make sense. A building jutting out much taller than anything around it is a jumble. It visually doesn’t seem to belong. It’s the architectural equivalent of being rude and arrogant, asserting itself above the world around it. This may seem like a strange assertion, but consider what happened to the urban core and the first ring of neighborhoods around it in cities all across the US when the freeways came through. These “dead zones” created havoc not simply next to the highway but miles away as the gradual density gradient that grew up naturally was interrupted. The natural density next to a freeway? Zero. The next block over? Nearly zero. And so on. How the Density Gradient Theory explains the abuse of the urban landscape during the freeway construction era. The result became an urban core that requires massive subsidy in order to maintain the height that city pride demands. Around this rotting core stood blight, defined as old buildings far larger than they should be for their circumstances, far too expensive to maintain with cheap rent and often torn down to create parking lots. 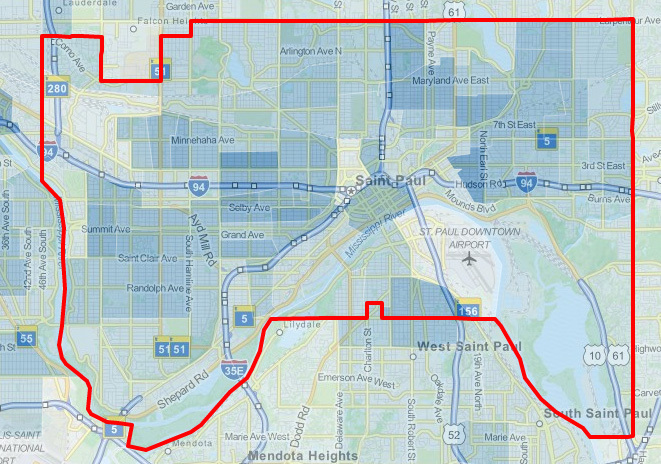 Population density in St Paul as per the 2010 census. From city-data.com. The goal of urban planning is primarily to encourage a gradual, sensible density gradient that is economically and aesthetically sustainable. When this rule is not followed in urban planning, land use eventually suffers and no amount of intervention and subsidy can create a stable neighborhood over the long haul. The description of how the density gradient theory works above may appear to be nothing more than a history lesson. Certainly, the mistakes of freeways and other dead zones are not repeated with the same brutality any longer. But other mistakes are made to this day. New Urbanism is often taken to mean high density mixed-use developments regardless of whether they make sense or not in the existing urban fabric. As a critic of New Urbanism, I like to point out that the principle difference between Old Urbanism and New is that the former simply happened and the latter is carefully planned. I consider this to be strong criticism because the designs of well meaning people with a lot of education cannot simply assert their will on a city. What, exactly, is “density”? In population terms it’s easy enough to map out, but in aesthetic terms it’s harder to describe. It varies some from one city to the next, too. But here in St Paul we can see that the existing urban landscape has shorter buildings away from the core and taller close to it. What is probably more important is the ratio of street width, including setbacks, to the height of the buildings around it. The Opus development at Seven Corners. A good example of the density gradient planned into a new building comes to us in the Opus design for Seven Corners. The building was completed in 2017 as Oxbo, where I now live. 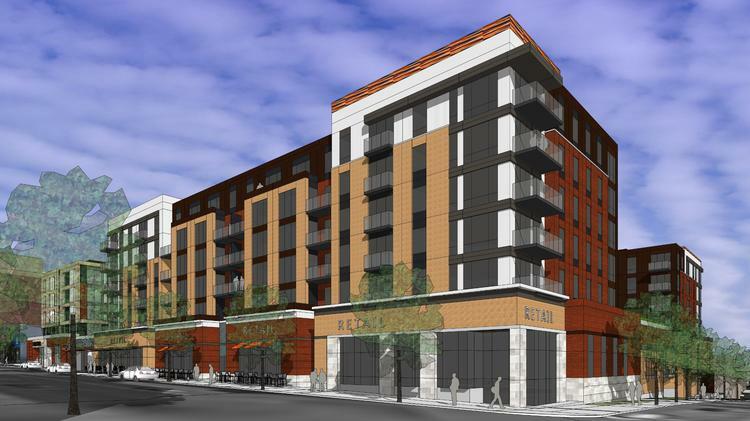 The 6 story (60 feet) height is not as wide as the 80 feet in front of it on West Seventh, a ratio of 1.3 that tells you that you aren’t in Downtown quite yet – but close. That same project would make no sense down at Randolph, where a height of 3 stories would probably be a reasonable maximum. This building re-weaves the torn urban fabric that was ripped up by decades of urban removal projects that were done without regard for the density gradient. It should be considerably more sustainable over the long haul – and is being built without any government subsidy entirely at market rate. How do we make more sustainable, livable cities? One important consideration is the density gradient, which is to say that any new project has to fit in with the old in a way that makes sense. There is no one approach and higher density is not always better. New Urbanism has to respect the old urbanism and have a light touch if it is to continue to be an effective tool for improving our cities. This entry was posted in People & Culture, Urban Life and tagged buildings, geography, urban design, Urban Life. Bookmark the permalink. Interesting. A focus on density gradient rather than absolute density makes sense.